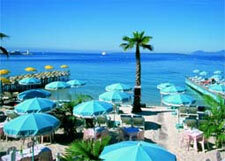 In the lingua franca of jazz, it is dubbed the New Orleans of the French Riviera. Juan-les-Pins, a precious enclave of Antibes set amid a promontory of pine trees and small coves, bustles with young people and avid followers of modern music through the summer, and it all reaches a zenith during two weeks of Jazz à Juan in July. The fabulous series of concerts showcases top contemporary performers and jazz legends in an unrivaled venue—the Pinède Gould, where the audience gathers mesmerized beneath the stars with waves lapping on a beach behind the stage. 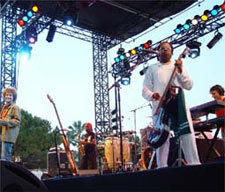 The event was devised in 1960 by an Antibes businessman and music fan named Jacques Hebey whose ploy was to draw notoriety to this small town across the bay from Nice. It took off in no time, and by 1965 Juan-les-Pins was considered the king of the jazz festivals, attracting with regularity the likes of Ella Fitzgerald and Sarah Vaughan, Ray Charles and Lionel Hampton, Miles Davis and Fats Domino. The blend of seaside atmosphere and internationally-acclaimed musicians on an outdoor stage embraced by pines was irresistible. For information and ticket sales contact Office de Tourisme, 11 Place de Gaulle, 06600 Antibes Cedex; tel +33 (0)4 92 90 53 00; fax +33 (0)4 92 90 53 01. On the Internet visit www.antibesjuanlespins.com.